Kommentar: The all New Prinoth Leitwolf Park :) 510 hp of parkpower! Kommentar: Brand new Prinoth Husky, delivered one day ago. World Cup at Lillehammer. 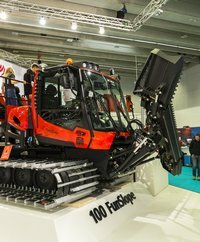 Technical details are known, but we will wait a bit to publish :) The machine is the first groomer with Tier 4f technology. Kommentar: Brand new Prinoth Husky, delivered one day ago. World Cup at Lillehammer. Technical details are known, but we will wait a bit to publish :) The machine is the first groomer with Tier 4f technology. Notice the full LED- lighting. Kommentar: Brand new Prinoth Husky, delivered one day ago. World Cup at Lillehammer. Technical details are known, but we will wait a bit to publish :) The machine is the first groomer with Tier 4f technology. Nordic Liner tracktiller.